The Bioplow is a three Hydraulic Recoil Shank tractor drawn injection machine. It has a non vacuum 10,000 litre coated tank fitted to a full rigid chassis with four walking beam tandem wheels. The self priming load and discharge pump is driven by a hydraulic motor providing by-pass and fine adjustment to agitate and suspend solids in tank and match discharge rate with ground speed and soil absorption rates. 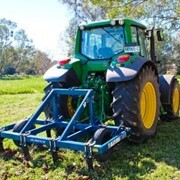 The Agrowplow Non-Inversion Tyne System and its desirable soil flow characteristics is the ideal tillage ground tool for the injection of substances. The Agrowplow shank is characterised by minimum surface soil disturbance and maximum sub soil decomposition. This action is essential if maximum discharge rates are to be achieved without surface emergents or contamination. Subsoil Slurry Injection with soil improving agents like lime and gypsum have been tested and the concept validated as an effective method of soil amelioration.